Returns whether the signal is connected to at least one slot. Connect a slot that takes no arguments. The signal is identified by a unique name within the scope of a WObject, or a unique global name (when declaring the signal in your WApplication). Construct a signal for the given object, and name. 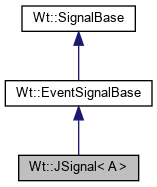 The given name must be unique for all user signals specified for the object object. Ownership of the signal is not transferred to the object. Unlike a JSlot, there is no automatic connection management: the connection cannot be removed. If you need automatic connection management, you should use connect(JSlot&) instead.